Take a look at the legs of most joggers and you see thin thighs. This is because jogging burns a high number of calories in a short amount of time. Although you cannot tell your body to only use the calories from your thighs, you will reduce the amount of fat from all over your body including your legs. Jogging is a high-impact exercise as you have only one foot on the ground at a time. It is easy to learn and requires no equipment, so once you get hooked on jogging, you can perform your workout anywhere and anytime. Warm up with a five-minute walk to prepare your body for the jog. Start slow and gradually increase your speed so that at five minutes you are almost near jogging pace. Jog for 10 to 20 minutes at a pace that feels comfortable and that allows you to carry on a conversation. Slow your speed if you are unable to talk. Jog faster if you are able to sing. Jog for one minute and walk for four minutes if you are new to jogging. Continue to jog and walk for 20 minutes. Increase the duration of your jogging intervals and decrease the duration of your walking intervals as your endurance improves and as each week passes. For example, jog for two minutes and walk for three minutes during your second week of jogging. Jog for three minutes and walk for two during your third week of jogging. Add hill intervals to burn a higher number of calories and tone your thighs. For example, jog on a flat road for one minute and then jog up a hill. Repeat the hill intervals for 20 minutes one or two days a week. End your workout with a three- to five-minute cool down walk to lower your heart and breathing rates. Perform your jogging workout a minimum of three days a week, if you are a beginner, and a maximum of six days a week as your strength and endurance improve. Allow for more days of rest if your legs are sore or tired. Wear comfortable and supportive athletic shoes with socks that do not slip in your shoes. Burn approximately 248 calories in 20 minutes of jogging, if you weigh 160 pounds. About 248 calories is half of the daily calorie-reduction needed to lose 1 pound a week. For example, 1 pound is equal to 3,500 calories. Reduce your calories by 500 each day to lose 1 pound a week and contribute to thin thighs. 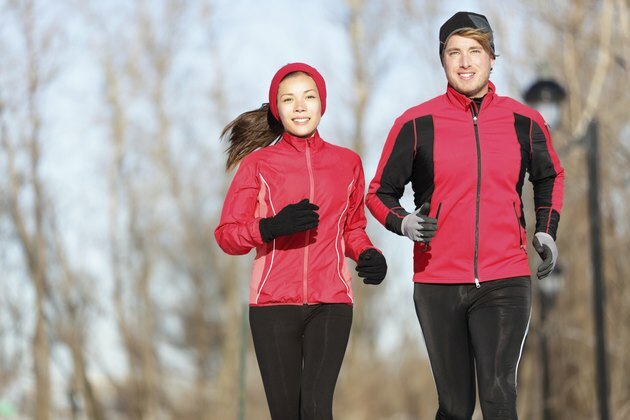 Speak with your physician before you begin a jogging exercise program.